Sometimes it's satisfying to spend a bit of extra time on your sewing project to get a super luxurious finish – particularly if you're making an outfit for a special occasion. 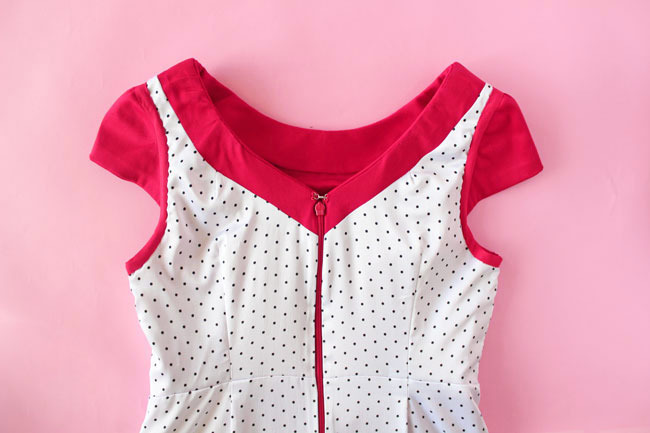 Vanessa here today - I'm going to show you how to make and attach a lining to your Etta dress. You can also use this tutorial to line many other fitted dresses, including those with a fiddly kick pleat. A lining will not only give your dress more weight and a flattering shape, it also reduces static and twisting - so no tugging around an unruly garment! When choosing a lining fabric, look out for something lightweight and drapey that feels lovely on your skin. Try acetate or poly satin (nice and cheap - but check it first as it can go a bit static), viscose (rayon) crepe de chine, silk satin or, if you really want to push the boat out, something like silk charmeuse. Tilly bought this lining fabric from A One Fabrics on London's Goldhawk Road. I've sewn this version in a gorgeous quality red sateen - an easy-to-work-with fabric with a touch of stretch for comfort and a subtle sheen for glamour. You can get your hands on the same fabric that I've used as well as all the notions you need in our Etta sewing kits. For ease, I'll refer to the outside, main fabric that you’re using for your dress as the "shell", and the inside fabric as the "lining". Sewing to the end of the angled seam of the kick pleat - finish sewing 15mm (5/8in) before the end. Trace a copy of these pattern pieces in your size, adding the notches and markings - front bodice, back bodice, front skirt, two back skirt pieces, front and back neckline facings. If you're making the three-quarter length sleeves, trace that pattern piece too. If you’re making the cap sleeve version, you don’t need to trace a copy of the sleeve, as it's self-lined. Cut 25mm (1in) off from the bottom of the front and back skirt lining patterns. Don’t use the ‘lengthen or shorten here’ lines for this as you need the kick pleat to start at the same level on both the shell and the lining. Shorten the sleeve pattern by 15mm (5/8in) using the ‘lengthen or shorten here’ lines. 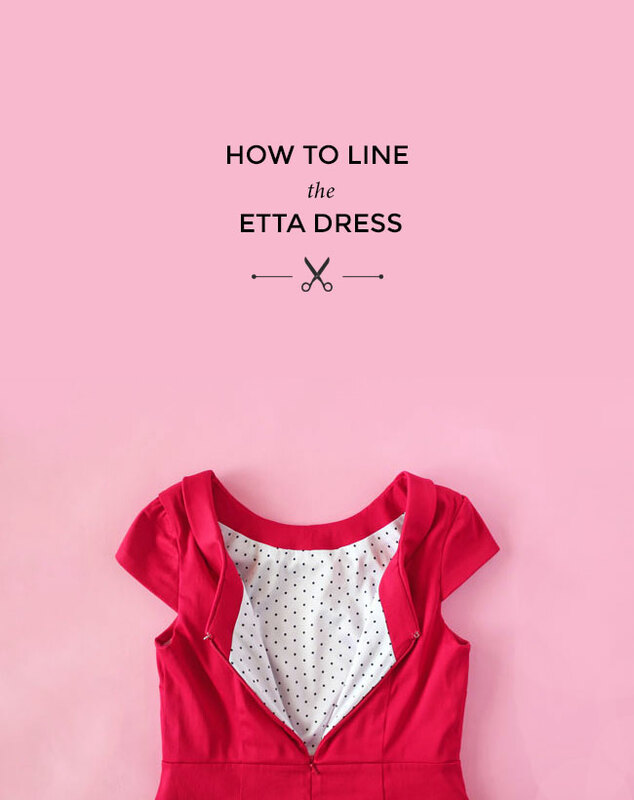 Take a look at the Etta fitting post for help shortening your pattern. Cut 15mm (5/8in) off the lower curve of the front and back neckline facing pattern pieces. Fold out the shoulder dart on the back bodice. Lay the front neckline facing over the front bodice, matching up the neckline and notches. Trace the lower curve of the facing onto the bodice. Cut the bodice along this line and discard the neckline facing. Repeat with the back bodice and back neckline facing. Place the downloadable template onto the right skirt lining pattern piece, aligning the pivot points and hem. Stick or tape down. Cut away the excess so the kick pleat is cut out, except for the seam allowance on the short-angled seam. Cut the bodice, skirt and sleeve pieces in lining fabric. If your lining is slippery, read Tilly’s tips on cutting and sewing slippery fabric. Stitch all the darts on the bodice - and three-quarter length sleeve if you're making it - following the instructions. Stitch just the first 25mm (1in) of each skirt dart from the waist down, leaving the rest open as a pleat. This will allow the lining to open up slightly as you move. Press them towards the centre. 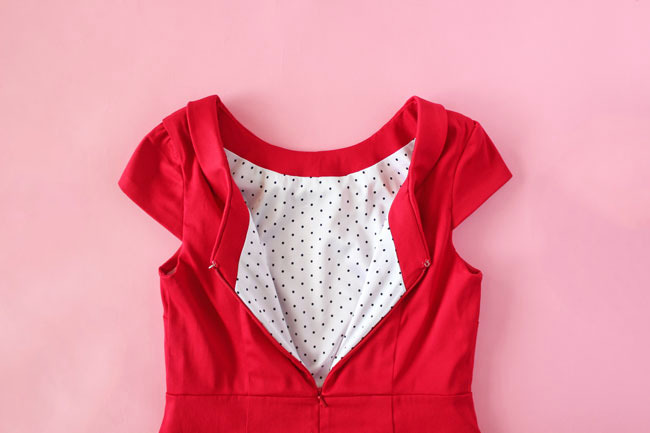 Follow the Etta pattern instructions to stitch the front and back bodice, front and back skirt and three-quarter length sleeve lining pieces together. Do not stitch the back opening or apply interfacing to it. Press the seam allowances open and then towards the back. Press the hem up to the inside by 15mm (5/8in), press it up another 15mm (5/8in) and topstitch in place. If you’re making the cap sleeve version, just stitch the bodice and skirt lining pieces together. We'll add the cap sleeves later. 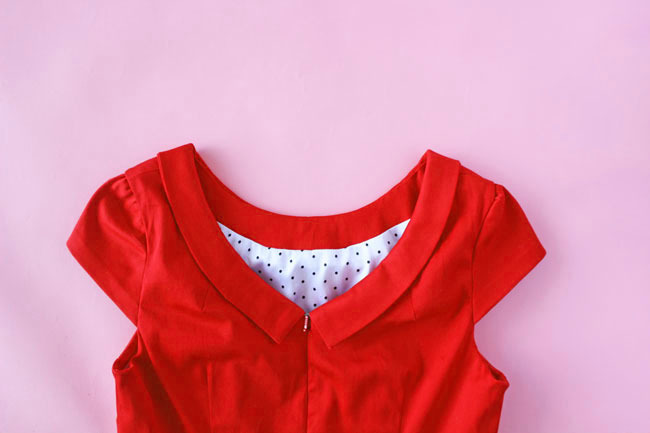 Fold the front neckline facing and front bodice lining in half widthwise and snip centres notches at the bottom of the facing and top of the lining. Lay the neckline facing over the bodice lining at the neckline, right sides together. Pin them together at the notches and shoulders. Ease together the rest of the curves and secure with plenty of pins. Stitch. Press the seam allowances down towards the lining. If you like, you can understitch the seam allowances to the lining, close to the seam line. Attach the neckline facing - with the lining attached to it - to the neckline of the dress following the pattern instructions. Stitch the short back edges of the facing to the zip tapes and back opening seam allowances with a 7mm (1/4in) seam allowance - an adjustable zip foot is useful here. Continue stitching down the back opening until you reach the bottom of the zip. Turn the dress inside out and pull the shell away from the lining. Stitch the bottom of the back opening seam of the shell together using a 15mm (5/8in) seam allowance. Start as close to the bottom of the zip as possible, turn at the pivot point, then stitch the short angled seam of the kick pleat together, stopping 15mm (5/8in) from the raw edge. Snip into the seam allowances towards the pivot point, being careful not to cut through the stitches. Stitch the bottom of the back opening seam of the lining together using a 15mm (5/8in) seam allowance. Start 25mm (1in) below the bottom of the zip and finish at the pivot point. Press the back opening seam allowances of the shell open, then press the kick pleats to the right hand side, aligning the hem edges. With the wrong side of the fabric facing up, stitch the left hand side of the shell and the lining together along the long seam of the kick pleat, right sides together. You will be stitching the side that you didn’t cut the section out of. Press the seam allowances open, then press the lining just inside the shell so it won’t show from the outside. Aligning the pivot points, stitch the shell and lining together on the other long seam of the kick pleat opening. With the wrong side of the fabric facing up, you will be working on the right hand side of the fabric and stitching the skirt piece that you cut the section out of. Snip into the seam allowances towards the top of the stitching line, being careful not to cut through the stitches. Press the seam allowances open. Snip into the seam allowances of the lining at the bottom of the back opening stitching line. Reach in between the shell and the lining and pinch together the short angled seams. Stitch the two layers of lining fabric along the short angled seam of the kick pleat, starting at the bottom of the back opening stitching line and finishing at the pivot point at the top of the kick pleat. Press the seam allowances open and then flat. Pull the lining away from the kick pleats and fold the hem of the shell to the inside by 30mm (1¼in). Press and pin in place. Topstitch the hem with a 25mm (1in) seam allowance. Fold the raw edge of the sleeve shell and lining to the wrong side by 15mm (5/8in) and pinch them together at the folds. With your other hand, reach inside the dress and down the sleeve - pinch together the raw edges of the shell and lining and let go of the outside with the first hand. Pull the pinched sleeve hems inside the dress and out through the dress hem. Pin the sleeve hems together and stitch. Pull the sleeve back inside the dress again. Turn the dress inside out and press the shell of the sleeve back on itself so that it folds to inside by 5mm (1/8in). Stitch the lining and shell together around the armhole with a 10mm (3/8in) seam allowance. 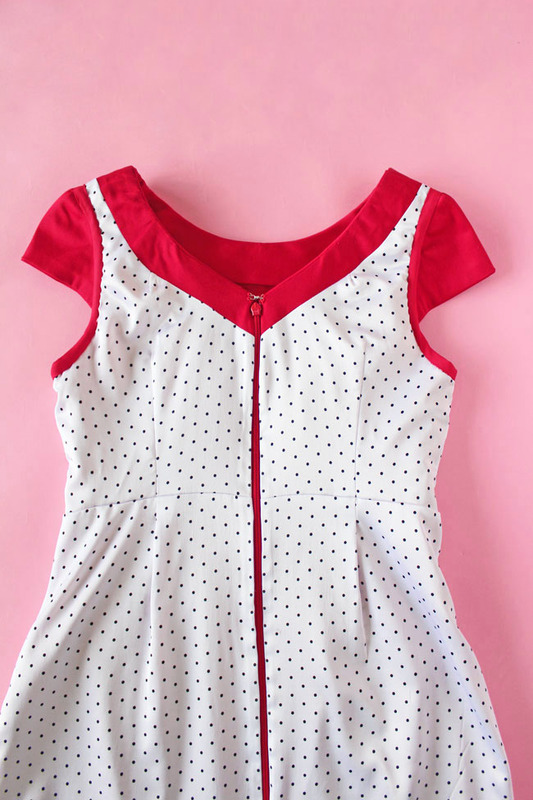 Attach the cap sleeve and binding to the armhole following the pattern instructions.